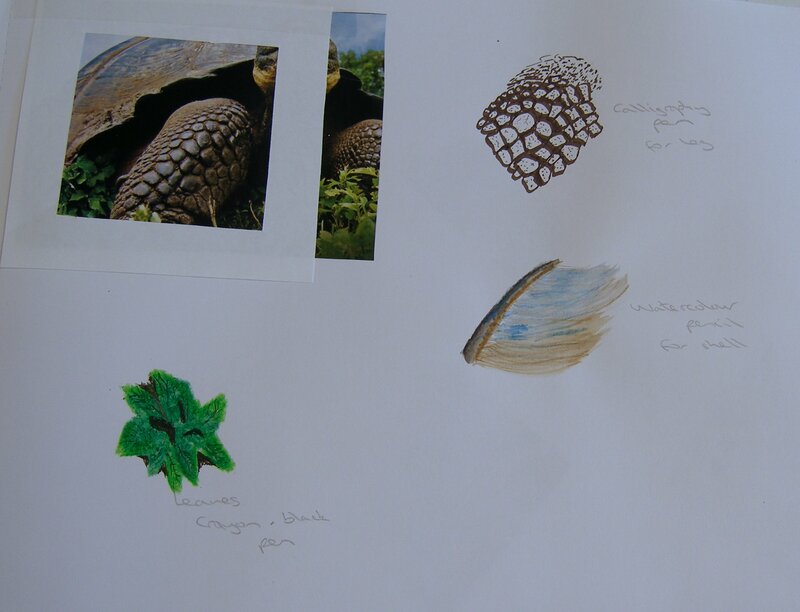 Working from images from magazines, postcards or books the brief was to choose an area in each image that is texturally interesting and then use marks and media to try to represent that texture on paper without trying to copy the image itself. My first image is of some oranges embedded with cloves. I tried 3 ways of reproducing this texture. Firstly with a crayon rubbing to achieve the nobbly surface of the orange, with pencil on top to create the cut areas showing the pith and the rounded cloves. I thought this was quite successful because of the way it shows both the texture of the orange and the cloves themselves – by the way I was obviously not trying to recreate the colour, just the texture! 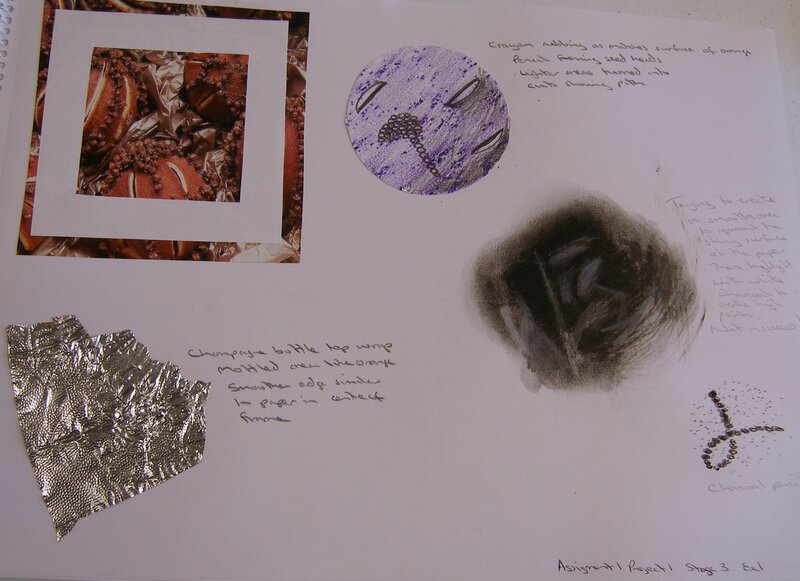 Secondly I simply chose a piece of foil from the top of a champagne bottle as this had the textural surface of the oranges and a smoother section at the edge which was like the smooth surface of the paper in the centre of the picture. My least successful attempt was the third one in charcoal. I was hoping to create light slashes with the putty rubber to represent the slashes in the orange skin but couldn’t get the putty rubber to lift the charcoal the way I wanted. I need to do more experiments with charcoal and putty rubber if I want to use this method in the future. This picture comes from an environmental magazine and shows an underwater plant. I really like the fluffy edges of the fronds and their colouration. I did use similar colours in my textural studies. At the top of the page I used watercolour pencils to replicate the underlying “branches” under the main plant. I added water to the central line of the branch but left the outer edges just with the bumpy line of the pencil to show the difference in texture and I feel that this combination produced a good result. 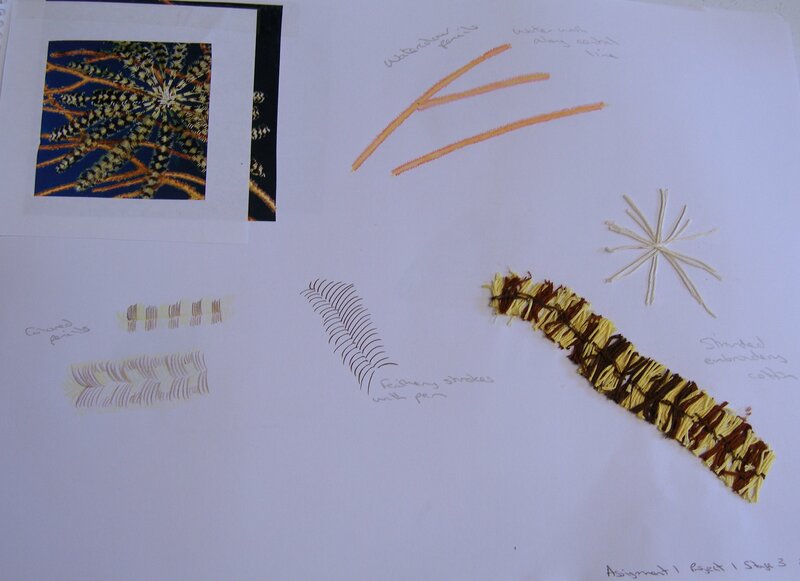 Underneath, from left, coloured pencils showing the fronds, then feathery strokes with a pen. To the right I used embroidery floss to represent the crossing texture in the centre of the plant and also the frond itself. I achieved this by wrapping the floss around a length of card, then back stitching along the centre of each side of the card to hold the threads together. I slid the piece off the card, cut down each side to form the feathery edges and then stitched the piece to the paper. The embroidery floss example worked well at reproducing the texture. The seas around Exmouth are home to hundreds of sea turtles and they have wonderful textural contrasts between their shells and dinosaur like skin. I used a brown calligraphy pen to replicate the texture of the leg on this example. The calligraphy pen has a chisel shaped nib that instantly produces different thickness and can also be used as a point to produce dots which I think was effective. For the shell I used watercolour pencil for the blue/grey smooth surface and then applied brown pencil on top to try to show the rougher striations. My third piece of texture from this picture was the leaves for which I used crayon with black pen on top for extra emphasis and to show the shadows.